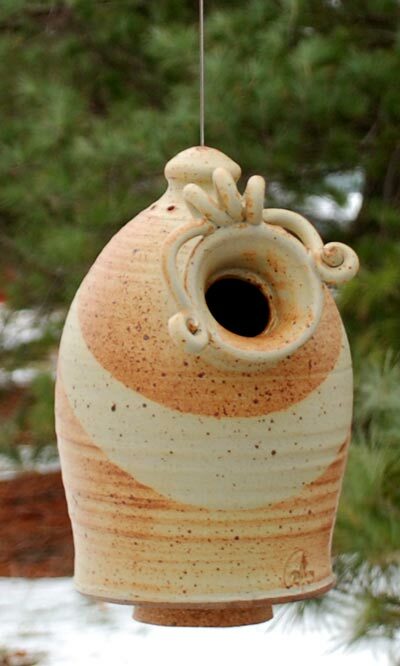 Add a dramatic abode to your garden with the Anthony Stoneware Hanging Bluebird House. The main body of the home flares gently outward and then in, creating a flowing shape. Slightly raised rings move upward along the house, adding movement and interest to it. The 1.875" diameter entrance hole has three loops on the top and two downward swirls to capture the eye, and the extended neck helps prevent predators from entering the home. Small holes around the top of the unit keep it ventilated, and three larger holes at the base drain moisture from the nest. The tan glaze and brown speckles will also accent the surrounding foliage, for even more effect. Use the included cork to mount the house to a fence post, or hang it with the attached plastic coated steel wire. Handcrafted from clay and then fired to 2400° Fahrenheit, with care this home will never fade, decay, or break down after exposure to UV light, for a charming item year after year. Offer a comfortable roost in your garden with this Hanging Bluebird House. Made in the USA. Droll Yankees Heavy Duty Locking Chain, Gray, 18"